The tools distributed here are for simplifying the editiong process of DKC hacking etc. 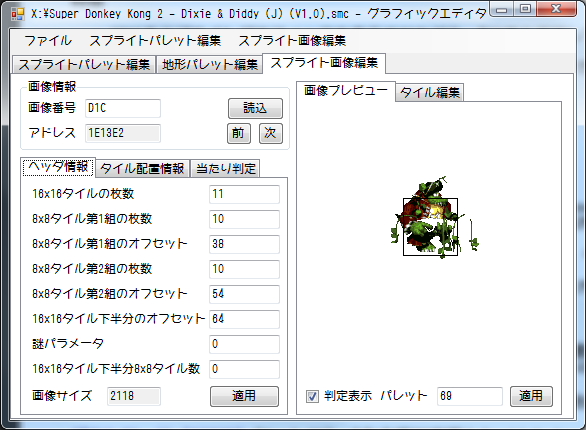 The administrator specializes in DKC2 so the tools are mainly for it, but there also are DKC1 and DKC3 tools. 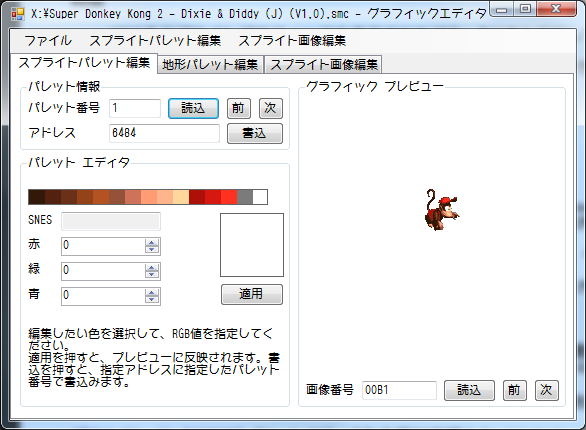 The links of the Core Tools for remodeling is posted here as well, so people who want to start DKC hacking are welcome. DKC2/3's multifunction hacking tool. 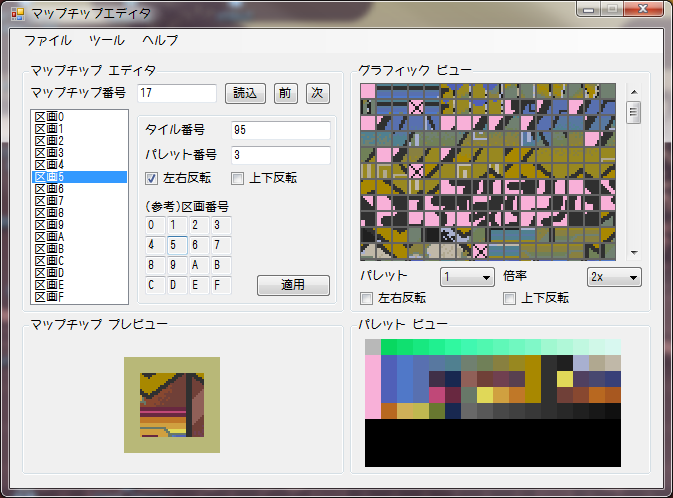 Able to change the locations of sprites and bananas, camera settings, level settings, import/export of tilemaps, etc. 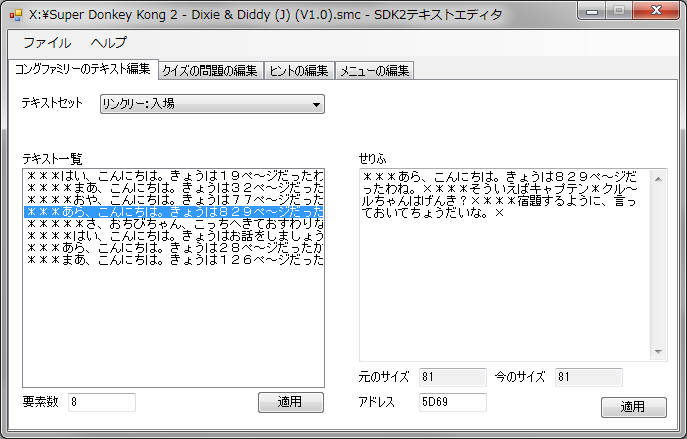 If you wish to expand DKC2's ROM to 6MB, use SDK2 Editor for 48Mbit ROM Edition or Super Gorilla Maker 2 located at the bottom of this page. Universal map editor software for editing tilemap data. You can't edit the level tilemaps without this. Hex editor. A software for fixing data that cannot be edited by tools such as SDK2 Editor. This opens all files, not just the ROMs, so please be careful. Grphics editor. Able to edit any umcompressed pucture data directly by loading the ROM as a picture file. * Since the software are developed upon the result of my personal analysis, please note that there is a possibility of defects due to the flaw in the analysis. Also, all tools are designed to be able to change the address since I highly value the data's extensibility, but changing the address without proper knowledge is very dangerous and may corrupt other data. * If noted otherwise, all the tools distributed on this page require a computer that has .Net Framework 4.5 or above installed. If Windows Updates were installed as nomally, ther should be no problem. * All the debugs were done on Windows7 Professional 64bit. I appreciate behavior reports on any other Windows OS. See the details at this page. The download link is there as well. 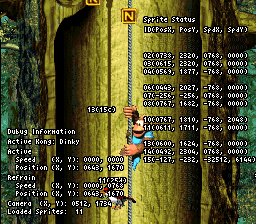 The completely original DKC2 multifuntion hacking tool created anew. Offers stronger hacking functions than SDK2 Editor. 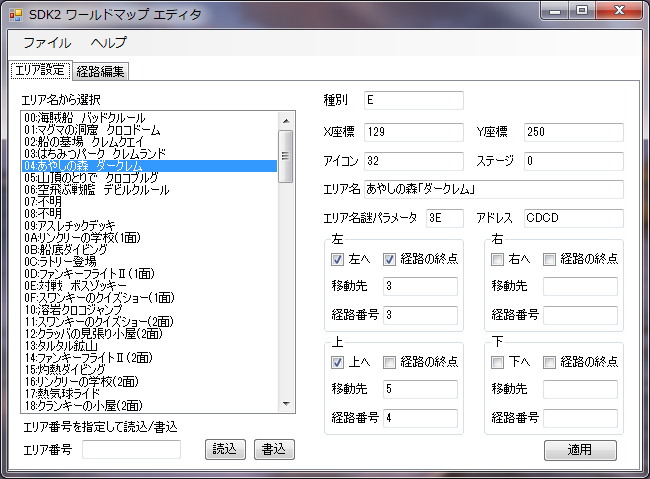 Loads Japanese, North American, and European 1.0 versions. 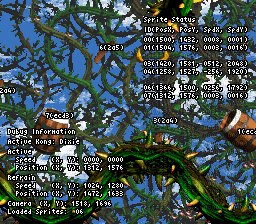 Loads DKC2's 48Mbit (6MB) expanded ROM. From Ver0.083 it loads ROMs between 32Mbit to 48Mbit, so those with standard ROM are now able to use this. Includes simplified tool that can expand the ROMs easily. Ver0.084 supports NTSC-J Ver 1.0, and Ver0.084(U) supports NTSC-U Ver1.0. It does not support ROMs or other regions and versions. Functions are exactly the same as original SDK2 Editor. Only supports Normal format for ExHiROM with 32Mbits+ size. 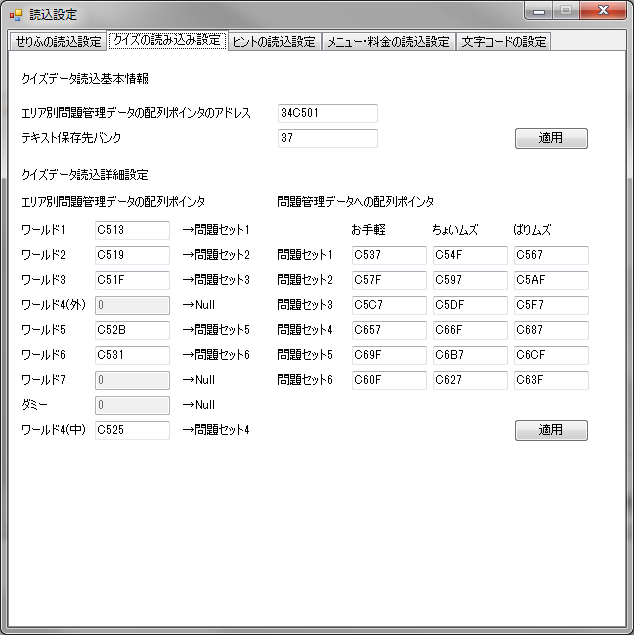 Supports both Normal/Interleave formats fot standard 32Mbit HiROM. Cannnot load ExHiROM larger than 48Mbits. [Ver0.084] Supports mapchip related data later than bank $40. Added normalization to color decoding. 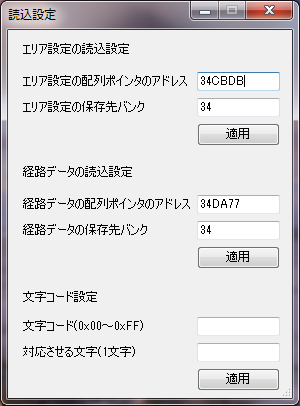 [Ver0.083] Supports 32Mbit standard HiROM and ExHiROM up to 48Mbit again. Made sprite location data loading process stricter. [Ver0.082] Supports data writing later than Bank $40. Made ROM check stricter. [Ver0.081] Fixed fatal bug that prevented saving data later than Bank $40. Changed the specification to 48Mbit ExHiROM exclusive. 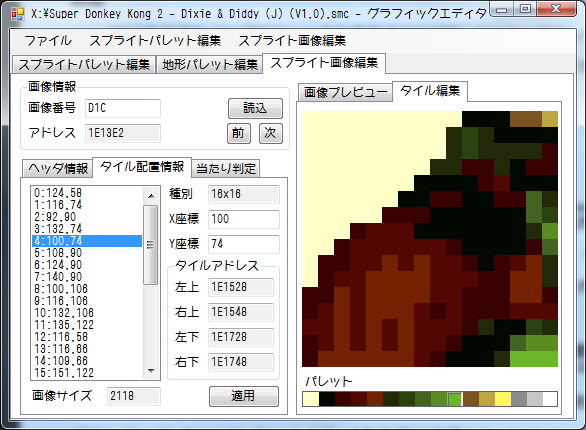 Sprite 16 color palette editing, tileset 128 color palette editing support. This tool is compiled with Microsoft Visual C#. Therefore, it will not work without .Net Framework Version 4.5 or higher. Ver1.0 supports NTSC-J version. Ver1.0U supports NTSC-U version. Headered ROMs are also supported. NTSC-J/U (Ver1.1), E version are not supported. NTSC-J (Ver1.1) is also supported. NTSC-U, E version are not supported. Interleaved ROMs are not supported. Fee editing for quiz, hint, flight, and Klubba. Level name editing is not supported. 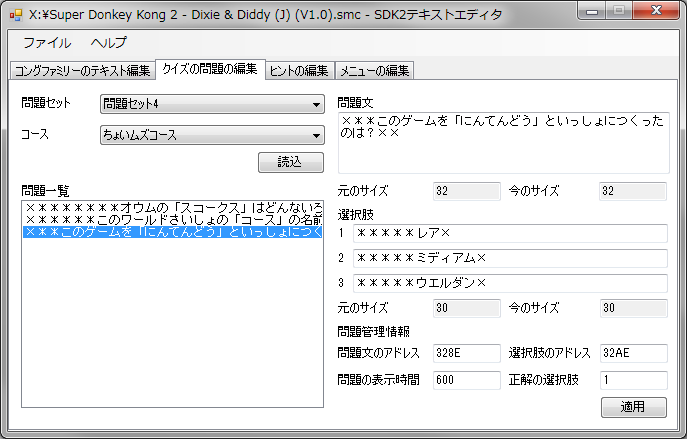 Please use sdk2editor or DKC2 World map editor to change level name. NTSC-J (Ver1.1) NTSC-U, E version are not supported. 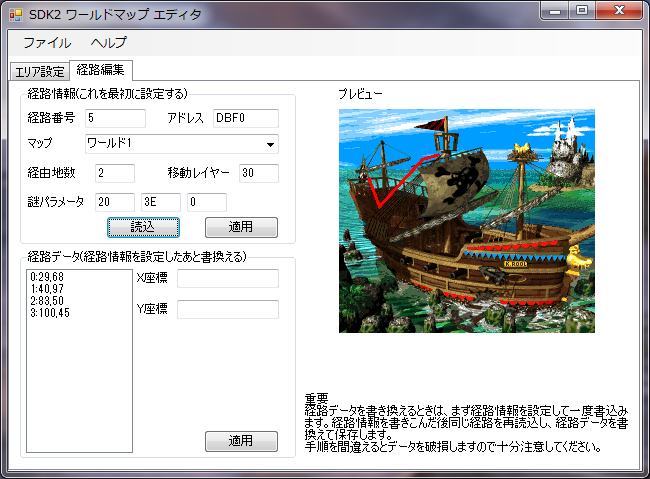 Ver1.1 supports NTSC-J version. Ver1.1U supports NTSC-U version. This tool does not use ROM data. But you need uncompressed GFX data, and 128 colors SNES palette. View sprite information which loaded on sprite memory. 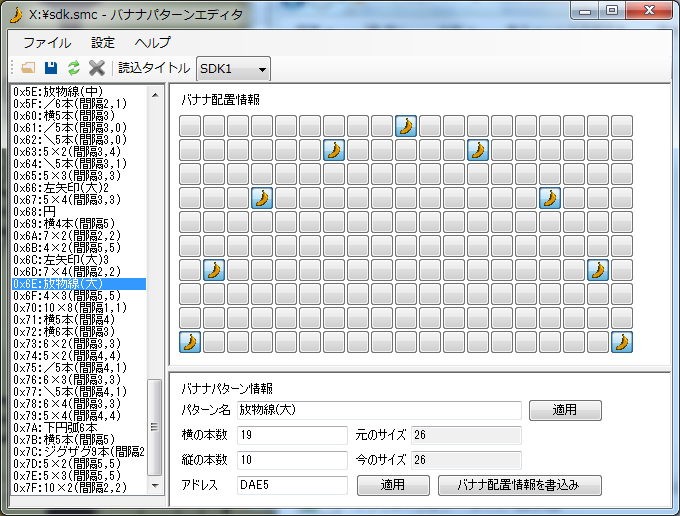 This tool is written by snes9x-lua-script. You need snes9x Ver1.43-rr or Ver1.51-rr to run this script. This script is based on NTSC-J version RAM address.